It’s no secret that fans of Shawn Mendes are head over heels with the Toronto-born singer and songwriter. 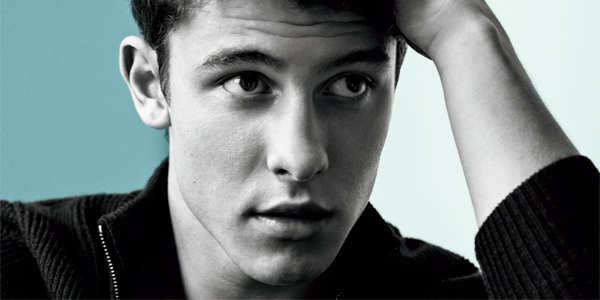 Shawn’s claim to fame began when his clips on Vine, the looping micro-video app, took off in 2013. He became the first person to emerge from Vine as a recording artist and has since released two albums: Handwritten (2015) and Illuminate (2016). Both made it to number one on the US Billboards. In 2016, Shawn appeared on Forbes’ annual list of “30 Under 30,” and he recently made it to number one on Billboard’s “21 Under 21 2017.” But Shawn has a lot more to offer his fans besides talent. From his philosophy on life, to his philanthropic work, to his new fragrance, here’s a glimpse of why we love Shawn Mendes. We’re inspired by Shawn’s philosophy on life and happiness, which he shared with a fan in a recent tweet. It read, “Do exactly what your heart says the first time it says it. Whether a good or bad outcome it is meant to be.” Now, that is a tattoo-worthy quote—and a testament to his way with words and his songwriting ability. Speaking of tattoo material, his family and city were the inspirations behind his own skin art. 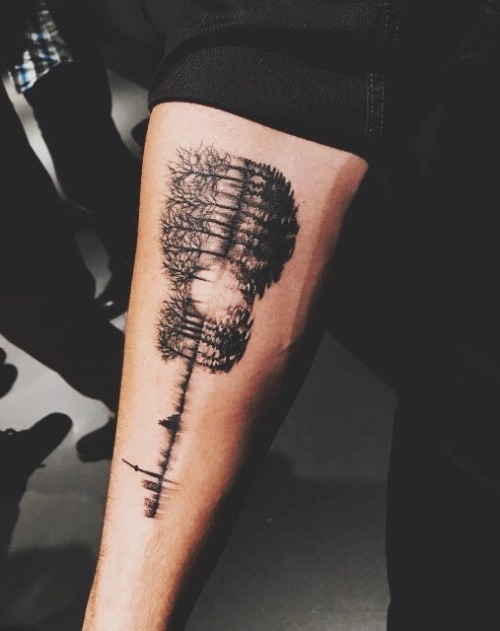 The abstract tattoo depicts an acoustic guitar made up of trees, the Toronto skyline, and a sound wave. If Shawn’s philosophy on life and loyalty to his family don’t have you swooning, his charity work will. He recently launched a Crowdrise campaign to raise money for the victims of the 8.1 magnitude earthquake that hit Mexico on September 19, 2017. Shawn was in Mexico City during the disaster and was scheduled to perform the following day. Seeing firsthand the devastation left behind, he was compelled to help. As of today, the campaign has raised over $180,000 for disaster relief. Back in April 2017, Shawn partnered with IZZE FUSIONS beverages in a free daylong festival dubbed Camp IZZE. The festival, which took place in New York, supported the T.J. Martell Foundation in cutting edge research for leukemia, cancer, and AIDS. Joining Shawn were Yara Shahidi, (co-star of ABC TV’s Black-ish) and Gaten Matarazzo (Netflix’s Stranger Things). In Shawn’s latest entrepreneurial endeavour, the 19-year-old created a unisex fragrance entitled Shawn Mendes Signature—which carries more than just an appealing scent. According to International Flavors and Fragrances perfumer Celine Barel, the fragrance was inspired by Shawn’s “artistry, passion for music, and his Canadian roots,” and has a “floriental woody scent.” The sky blue and bronze colour scheme on the packaging complements the “pour femme et pour homme” objective. The bottle cap design has guitar strings wrapped around it, representing his love for the instrument. The box includes an illustration of his tattoo, reiterating its significance. 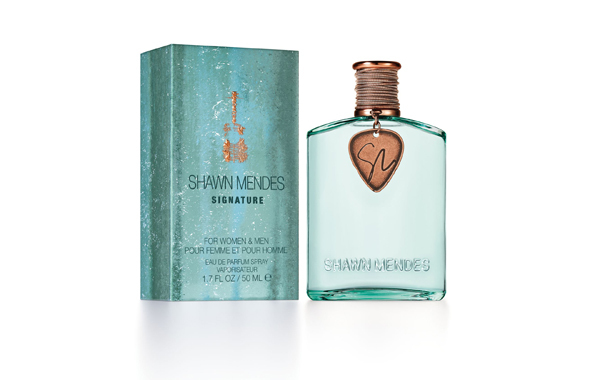 Shawn Mendes Signature is available exclusively at Shoppers Drug Mart, 50ml, $60. So, what more does Shawn have in store for us? Despite being on his third world tour, the Illuminate World Tour, he is busy working on his third album. Shawn tweeted on September 29: “Love you guys. Starting album 3 this week.” There is speculation that SM3 (what his fans are calling his third album), will feature a piano ballad he posted online a few months ago. As far as features and album length go, Shawn is keeping his fans on their feet (hopefully, not for too long! ).